BELIZE CITY, Thurs. Dec. 8, 2016–The odds are clearly in favor of standings leader and defending Premier League of Belize (PLB) champions, Belmopan Bandits SC, presently sporting 8 players on the National “A” Team of Belize. But the ‘ballers from Belize City are not intimidated. After a turbulent mid-season slide, including a forfeited home game to the Bandits, and back to back losses to Police United and BDF, former two-time champions (2006 and 2007) FC Belize pulled out a big win last Sunday at the MCC against Freedom Fighters of Toledo, which catapulted them into 4th seed in the PLB playoffs, and a clash with #1 seed Belmopan Bandits SC. 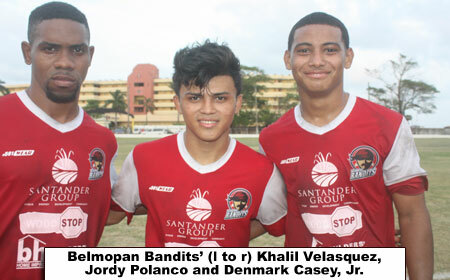 In their only meeting on the field this regular season, in Week 1, they held the Bandits to a 0-0 draw on their home turf at the Isidoro Beaton Stadium. Only one FC Belize player, young defender Francis Arana, was called up this week to join the training camp of the National “A” Team. But when they take the field on Sunday in game 1 of their semifinal series at the MCC Grounds, it will be eleven versus eleven. And some other youngster on the FC Belize eleven will be aspiring to prove they also deserve a second look by scouts for the “A” Team. There are some marked contrasts and some similarities between the two teams. The Bandits’ ownership/sponsorship is recognizably stable and financially secure, with Government Minister Hon. John Saldivar firmly in control. There have been no scandals or controversies emanating from inside their camp in regard to problems meeting players’ salaries, etc. The same cannot be said for FC Belize, who experienced severe controversy in mid-season, resulting in a rebellion of sorts by the players, culminating in a change of management. Unfortunately, reports are that the original problem with players’ salaries, due to a shortage of funds, is recurring, and the new manager/sponsor is threatening to pull out if other help cannot be secured to carry a portion of the financial burden. Come Sunday, if they can hold the ship together a few more days, FC Belize will be playing with a desperate state of mind. Their payday is not secure, unless they can find a way to earn another home-game bonanza, as in the championship finals. Already “in the hole” reportedly over $10,000.00 during the past six weeks with the team, the new management is hoping to cover some of this debt with a good gate this Sunday. Another good home gate in the Finals would allow a welcome treat for the players. There is no such urgency in the Bandits camp; just a professional commitment to win, as they have been doing all season long. And it helps that they are inspired by the almost certainty of seeing CONCACAF action if they should claim the championship this season. They sport a 13-point advantage over second place BDF in this Opening Season regular season, which is not likely to be surpassed in the Closing Season. Both teams are strong in the goalkeeper department. The Bandits are anchored by the veteran Shane Moody Orio, whose closest competitor for top honors this year would be BDF’s Tevin Gamboa. Meanwhile, FC Belize has Mexican import Rodrigo Vasquez between the sticks, and he has done a stellar job this year. One other factor of note in Sunday’s clash at the MCC, is coming from their immaculate carpet at the Isidoro Beaton Stadium, sources near the Bandits camp are saying that the team is wary of the very uneven surface at the MCC. Familiarity with the “horse gallop,” that is the MCC nowadays, may prove to the advantage of FC Belize in Sunday’s encounter. Also, FC Belize players are accustomed to playing at 4:00 p.m. in the evening sun, while the Bandits’ home games are always on Saturday night. We won’t miss this one!